Property investors often rely on tax breaks to help them afford their property. Waiting until the end of the financial year to receive your tax return can cause cash flow problems, particularly when unexpected repairs and maintenance crop up. But the good news is you don’t have to wait until the end of the financial year to receive your claim. Deductions for expenses related to owning an investment property, such as interest, rates, repairs and maintenance, property management fees, capital works and plant and equipment depreciation can be received on a more regular basis throughout the year simply by choosing to use a Pay As You Go (PAYG) withholding variation. A PAYG withholding variation allows you to take advantage of deductions regularly, rather than in one lump sum at the end of a financial year. It allows your employer to vary the amount of tax withheld to anticipate tax liabilities and as a result you can adjust what you receive in your fortnightly income. To support your PAYG withholding variation, contact a specialist Quantity Surveyor to order a tax depreciation schedule. This schedule will outline all current and future depreciation deductions for an investment property. The higher the depreciation deductions are, the less tax you will need to be taken out of your pay. Once a request has been approved by the ATO, your employer will reduce the amount of tax withheld, increasing your take-home pay. Remember, a PAYG withholding variation doesn’t replace your normal tax return. You will still need to visit an Accountant at the end of the year to calculate the actual amount of tax liability. 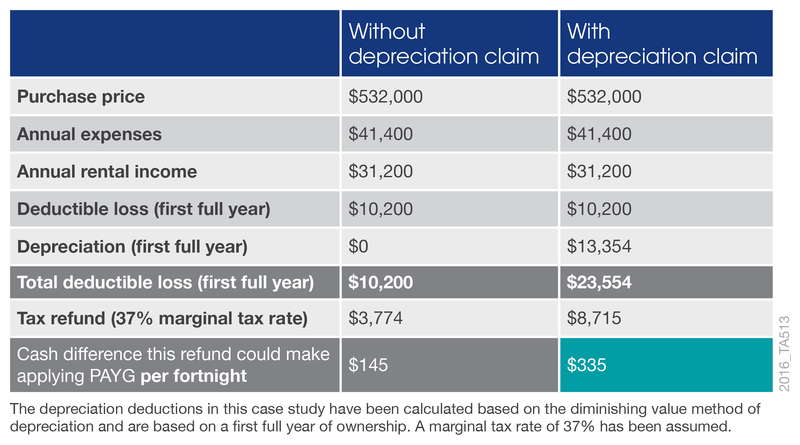 How will depreciation deductions make a difference? The following case study compares a PAYG claim with and without depreciation. In the case study, the investor owns a brand-new house purchased for $532,000 which is rented for $600 per week, an income of $31,200 per annum. They also have expenses for interest, rates, repairs and maintenance, property management fees and insurance totalling $41,400. Where depreciation isn’t claimed, the investor receives an additional $145 per fortnight in their pay by applying the PAYG withholding variation. But with a depreciation claim of $13,345, the investor receives $335, or an additional $190 in their fortnightly pay. As can be seen here, a PAYG withholding variation will provide added flexibility for a property investor. Having access to the extra money during the year makes it easier to manage cash flow, especially when there can be surprise costs such as urgent repairs or maintenance. The additional income also gives the owner the option to invest the extra money or reduce loan liabilities. A PAYG withholding variation makes a difference to a property investor’s regular cash flow. A specialist Quantity Surveyor can add to this by providing a tax depreciation schedule before you submit a PAYG variation request. Quantity Surveyors are one of the few professionals qualified under the Tax Ruling 97/25 to estimate construction costs for property depreciation purposes. For obligation free advice about an investment property situation contact the expert team at BMT Tax Depreciation on 1300 728 726 or visit www.bmtqs.com.au.